Continuing where we left off on Friday (matters maritime) but this time from the wonderful Clonbrock Collection. This view may not be as iconic as the Skelligs, but nonetheless it provides a pleasing vista with sea, sky, mountains and a safe harbour. Following the tremendous achievement of the Irish Rugby team on Saturday in beating World Champions New Zealand Ireland can bask in the teams reflected glory for a wee while! A wild upside-down guess - Bray ? 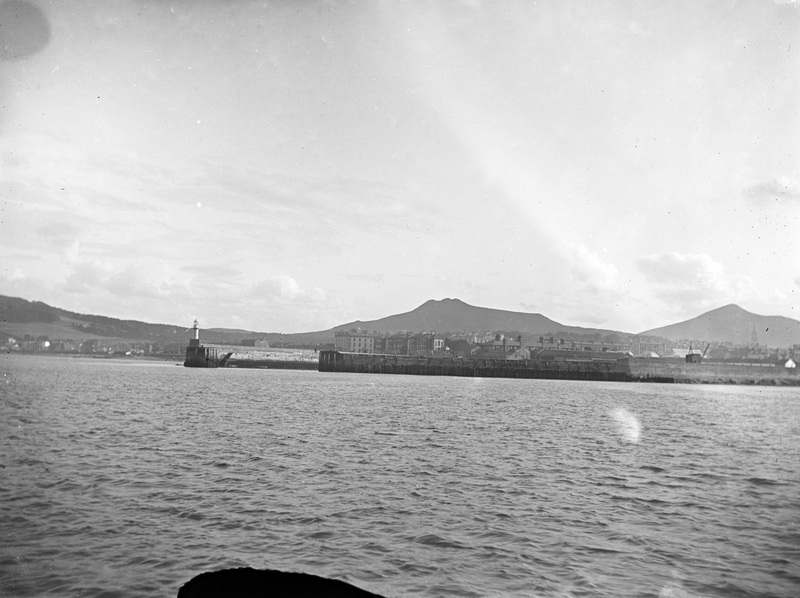 [https://www.flickr.com/photos/beachcomberaustralia] Looks like Bray alright, although I think the lighthouse is long gone. [https://www.flickr.com/photos/beachcomberaustralia] I think you might be right. Streetview from north pier. Then it's after 1897 when the lighthouse was built and before 1957 when it "fell into the sea during a storm." [https://www.flickr.com/photos/beachcomberaustralia] Robert Lloyd Praeger of this Parish!! From Wikipedia He worked in the National Library of Ireland in Dublin from 1893 to 1923. He co-founded and edited the Irish Naturalist, and wrote papers on the flora and other aspect of the natural history of Ireland. He organised the Lambay Survey in 1905/06 and, from 1909 to 1915, the wider Clare Island Survey. He was an engineer by qualification, a librarian by profession and a naturalist by inclination. The [https://www.flickr.com/photos/nlireland] is always amazing! The combination of Bray and the fact that it was taken from a boat makes me think this is another Meldon photo. The lighthouse collapsed into the sea during a severe storm in or about 1956. [https://www.flickr.com/photos/scorbet] Perhaps from a WaterWag? I really enjoyed reading Praeger's book "The Way That I Went", I learned a lot about Ireland. [https://www.flickr.com/photos/nlireland] That was my theory! But if I remember correctly from previous investigations of the Meldons, Louis Meldon (Sr.) also had a motor launch around this time. Fantastic to see that Bray once had a Lighthouse.